The Lincolnshire coastal strip runs the 50 or so miles from the Humber (the northern division between Lincolnshire and East Yorkshire) to the Wash (where Norfolk meets Lincolnshire). The Lincolnshire coastline offers some amazingly sandy, clean, Blue Flag Award winning beaches stretching for miles. With the arrival of rail links, numerous holiday resorts and caravan parks emerged along the coastline to cater for a diverse range of holidays in Lincolnshire. Couple this with a range of places to stay such as bed & breakfasts, hotels and self-catering cottages you should find suitable accommodation for all your holiday needs. 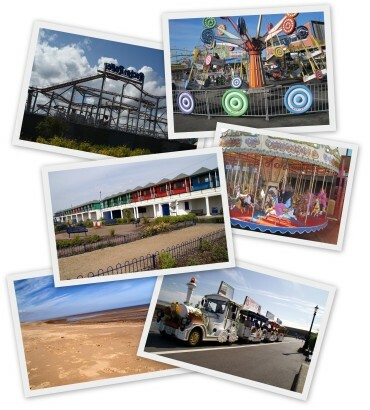 Most tourists visiting Lincolnshire with the coast in mind head for the bright lights, amusements and rides of Skegness. Often referred to as "Skeg" or "Skeggy", it has everything from donuts to donkeys. Skegness is probably the best known town in the county and home to The Jolly Fisherman and the first Butlins Holiday Resort. Cleethorpes is a little quieter with its lengthy promenade and pier. And you really must ride the wonderful Coastal Light Railway if you visit Lincolnshire. The sounds and smell make you very nostalgic - assuming you're of a particular age! If it's quaint you're after try Sutton on Sea with its rows of brightly coloured beach huts or Chapel St Leonards for that feeling of nostalgia. And for a quiet picnic spot pop along to Moggs Eye Beach, Chapel Point Beach or Huttoft Car Terrace Beach beaches during the week as you'll pretty much have them to yourself.